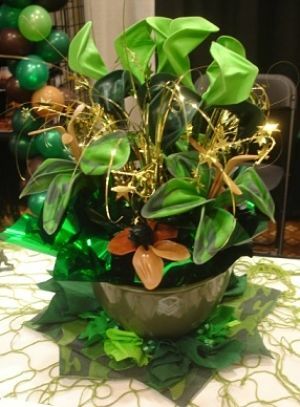 Floral gala centerpieces are the norm at most of our auctions, but are other ways of decorating your table. Check out this NON-floral, balloon centerpiece I saw in St. Louis, MO last week at the Missouri Meetings & Events Expo. The “Boot Camp” theme of the Expo wasn’t lost on the company that brought this balloon bouquet. American Carnival Mart decked out their booth in full Boot Camp motif, so this “floral” arrangement is on the green-and-black side. As you can see, the balloons aren’t filled with air; they are stretched over frames to create the look of flowers. Here’s what you might like about about this idea. 1. Flowers die; balloons don’t. If you plan it right, you can use your balloon centerpiece at other functions or split the cost with the school holding an auction down the road. 2. Flowers could trigger an allergic reaction among guests. Outside of a latex reaction (and doesn’t one need to touch latex for that to happen? ), I can’t imagine a reaction with this type of centerpiece. 3. These are easily portable. Keep in mind that there’s no water to splash about. It’s contained, seemed fairly sturdy and doesn’t have the liquid issue. As an overview, remember that your gala centerpieces should be small-ish and – as evidenced by this photo – don’t need to be floral. This is a great tip, Sherry! We’ve been using balloons as decoration at our silent auction, where there isn’t a formal dinner and therefore no dining tables. We use balloon “sprays” around the room to add color and festivity and a big balloon arch in front of the building. Balloons are MUCH CHEAPER than flowers, too! Regarding the latex allergy, we have run into that problem: one of our donors has an allergy and has to limit her time around the balloons (I guess you don’t need to touch them.) But that doesn’t stop her from coming and spending lots of money! So I recommend them! This centerpiece is awesome!